O (Observation): Zechariah experiences joy and fear, law and gospel. He is told of great and (seemingly) unbelievable news! He is to be a father!!! But…he and Elizabeth, his wife, were very old. And was considered barren. Yet, somehow, God brings life were there wasn’t life. And promised that not only would they be parents, but their son would be destined to be a prophet for the Lord…he would receive the Holy Spirit, even while still in the womb! A (Application): Law and Gospel are apparent in the Old and New Testaments. Many mistakenly see the Old Testament as “Law” and the New Testament as “Gospel.” The scriptures themselves point out the folly in this way of thinking. Take today’s text, for example. Zechariah and Elizabeth know of the brokenness of creation in the fact that they cannot bear a child, and yet Gabriel, the Lord’s messenger, has been sent to declare to Zechariah that they will indeed bear a son! That gift of a son is the very gospel at work. Zecharaiah experiences law again as his doubt makes him unable to speak, but upon the birth of his son, he will be able to speak again, which is the gospel. We would do well to recognize our sinfulness (the law) as well as God’s grace all around us. We can look to both the Old and New Testaments to see our brokenness and God’s grace on display throughout the generations of God’s people. And we can look to those who have come since the time of Jesus, since the time of Paul…and see brokenness and grace. I see grace when I seek forgiveness for the wrongs I’ve committed. I see grace when I forgive others for the harms they’ve done to me. It’s easy to see the law all around us…and because of that, we like retaliation and victories over those who harm us. And yet…. Grace is the path we are called to. Grace is the simple, but difficult path to follow. Thankfully, the Spirit comes to dole out the grace and guide is in the use of that grace, daily. Where do you see the Law today? Where do you see the Gospel? 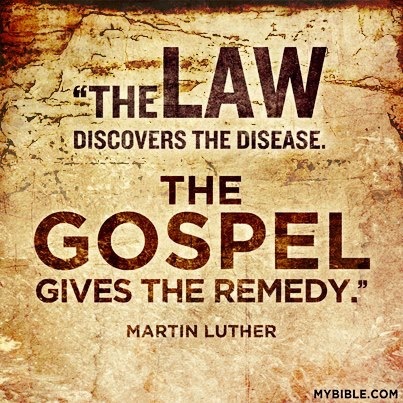 P (Prayer): Lord, guide us and help us to see the Law and Gospel in your words and actions. Help us to see the difference and to point out your Good News along way. Amen. This entry was posted in Digging Daily and tagged Bible, Elizabeth, Gospel, John, Law, Zecharaiah. Bookmark the permalink.